As I approached the half-way point of All the Pretty Horses, I started to think about how I would review this book. I decided to begin by describing Cormac McCarthy as a ‘punctuation minimalist’ but, in hind-sight, I don’t think this term goes far enough. Perhaps ‘punctuation denier’ or ‘comma tease’ would be more appropriate labels (…I admit that neologism isn’t my strong point). All the Pretty Horses contains no speech marks, semi-colons, ellipses, dashes or parenthesis; very few apostrophes and even fewer commas. The full-stop is the only standard unit of punctuation employed here, and often comes at the end of very long, complex sentences. What’s more is that McCarthy’s syntax is frequently polysyndetic – long chains of conjunctions separate short noun groups, with multiple actions being described in single sentences; a style reminiscent of William Faulkner or Ernest Hemmingway. All of this would be incidental, however, were it not coupled with highly accomplished writing. The prose is alive with metaphor, evocative imagery and unusual philosophical asides. This linguistic and grammatical aesthetic is highly stylized; here metaphors don’t merely comment on what is being described, but actively create it –for both the reader and the characters. The identity of the American landscape is inextricably entwined with the language used to forge it. So, what’s it all about? I would describe All the Pretty Horses as a bildungsroman; a coming of age story. Set in 1949, John Grady Cole is sixteen when his mother sells the Texan ranch he has grown up on; he simultaneously loses his inheritance, his way of life and his tight-knit family community. Bewildered and cut-off, Cole sets out for Mexico with his friend Lacey Rawlins, searching for work as a ranch hand or ‘Vaquero’. On the Mexican border the pair meets a third boy – Jimmy Blevins – a mysterious character reluctant to open up, but dangerous and hot-headed. As they travel through the barren but beautiful rocky deserts of northern Mexico, it becomes apparent that the only way of life they’ve ever known or ever wanted is slowly fading away. As Cole’s childhood passes, so do his dreams of a simple, innocent life as a farmer. In Mexico he falls in love with the daughter of a rich Hacendado; a relationship doomed to tragedy as the actions of Jimmy Blevins catch up with all three boys and their journey turns into a violent struggle for survival. 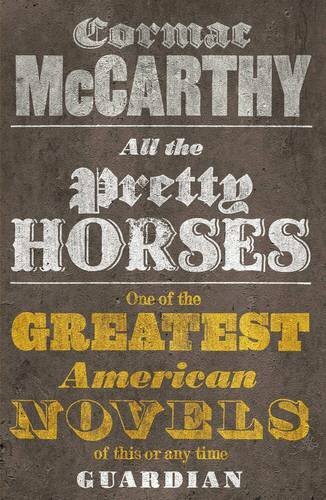 McCarthy’s America is desperate, cruel and rugged; All the Pretty Horses becomes a parable of responsibility, retribution and an impossible search for redemption. Much of the novel takes place in the mountainous border country of northern Mexico – vivid and enormous, the harsh desert offers an echo of the brutal and hand-to-mouth life of its inhabitants. I can’t stand reviewers who describe the landscape of any given novel as a ‘character’ (I don’t believe it’s possible to psychologise a landscape), but much like in Wuthering Heights, the environment and geography metaphorically sympathise with the protagonists and their plight in a significant way. My enduring mental image of this novel is the barren country: unforgiving and unbiased. All the Pretty Horses is a novel of discovery – the great theme that dominates American literature. For McCarthy, America is very much a frontier country – a wilderness still to be explored and tested, as it will explore and test you. What dialogue the novel contains is simple, short and sharp – actions, not words, form the true currency of exchange and value. Violence and death permeate. I was exhilarated as I read this book – it is violent, but not in a glamorous or stylized way; the violence is desperate and savage, a brutal deconstruction of the peace and happiness that John Grady Cole enjoyed in his childhood. He engages in it out of necessity – violent action becoming an unwanted right-of-passage to his adult life. Cole is a likable protagonist – his morals and dreams are tested to the limit and paid for in blood and heartache. You want, want him to find his way and to recapture the ideal of his lost innocence, but you know it won’t or can’t ever happen the way he (or you) wants it to. All the Pretty Horses is a unique example of the ‘Southern Gothic’ genre. I cannot praise this book enough – it’s a justifiably much-loved American masterpiece. I’ve never encountered a work in which narrative style and content converge so meaningfully or so successfully. Cormac McCarthy’s language doesn’t just tell the story; it’s an integral part of it, as the short, wistful dialogue imbues pathos and nostalgia, so it reflects the empty, desolate country in which it takes place. This entry was posted in Novels, Reviews and tagged All The Pretty Horses, Cormac McCarhty, Ernest Hemmingway, Southern Gothic, Western, William Faulkner, Wuthering Heights. Bookmark the permalink. I like your suggested labels – punctuation denier – comma tease. very good. They resound with me because I am currently proofing a book I recently finished writing. What would I be? A grammar guerrilla maybe? Or so my intolerant spell-checker might tell you. All The Pretty Horses sounds interesting, vivid and challenging. I have not got round to it so far. Perhaps I was deterred by its reported density. It’s often suggested that potential readers cannot cope with such convoluted sentence structure. It tends to be the way my mind works sometimes. So maybe it’s time I followed your example and read this book. To be honest, I found ‘All the Pretty Horses’ very challenging to write about. I’d never usually begin a book review with such a long, technical analysis of grammar – but it’s almost unavoidable when writing about McCarthy, and I wanted to get it out of my head and into writing before I began to critique the ‘meat’ of the novel. I’m glad you like my labels regarding punctuation – they’re only intended to be tongue-in-cheek. I was going to begin my review with a much simpler statement – something along the lines of ‘McCarhty writes with an ungrammatical lack of punctuation’ – but I thought this somewhat misses the point of his style, so I opted for my longer rambling about the difficulty of pinning down his punctuational style. Please don’t be deterred by the novel’s ostensible density. As I said in my review, I found it hard-going for the first 20(ish) pages, but I was amazed at how quickly I got used to the writing style. Stick with it – the rewards are more than worth the effort. Promise. I can’t say that you make me want to read this book, exactly, but you do make me want to read more of your reviews. You’ve got a good way of describing things, which I have to say, is quite impressive. I will, however, keep this book in mind for next time I’m feeling brave, and I want to venture out of my comfort zone. After your comment on ‘The Crossing’ to this effect I went back and looked at the pages as you would a work of art and did wonder if the removal of that extra type and puntuating symbols didn’t make for a cleaner, less encumbered read. I think McCarthy almost proves the point – it isn’t required.